On the eve of Tuesday, March 25, 1986 (Baramhat 16, 1702 A.M.), the Holy Virgin Mary started Her apparitions in the church of Saint Demiana the Martyr in Papadouplo, near El-Teraa El-Boolakia street, in the overcrowded Shoubra quarter of Cairo, Egypt. The church of Saint Demiana in Papadouplo is a very small and poor Coptic Orthodox church and the surrounding "streets" are very narrow (about 4 meters wide). On this day, our Lady appeared beside the two towers of the church of Saint Demiana and was first seen by people living in the houses overlooking the church's towers; Her light shone in their houses and they saw Her in Her full body surrounded by a halo of light over the left (western) dome of the church. 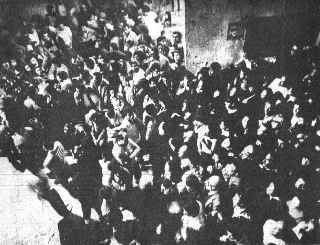 This apparition was repeated several times, then the news spread and people from all sects and religions came to see the apparitions. The very narrow streets surrounding the church became overcrowded with thousands of night vigils (see figure on the right) praying and singing doxologies, liturgies and hymns to the Mother of True Light for whole nights. waiting for their turn to enter the church. Some of the inhabitants of the houses around the church said that they saw flashes of light shining over the church starting a few months ago, but nobody reflected on the matter. It was only when the Virgin appeared that they started to link the preceding events with the apparitions of the Virgin. The Papal order, dated April 9, 1986. As we have received news of spiritual phenomena occurring in the church of Saint Demiana in Papadouplo, Shoubra, we have entrusted a special committee to investigate this matter, and present a report, after examining the news we have received, and the witnesses of those who have seen unnatural phenomena in the church in Shoubra. We ask God to help the committee members accomplish their job. the apparitions at Saint Demiana church, in Papadouplo, Shoubra. of the committee and Mr. Mosaad Sadek are to the right of H.H. the Pope. bishop of youth and Anba Serapion, bishop of social services. The committee examined the accounts of eye-witnesses, and on Thursday, April 10, 1986, at midnight, the members of the Papal Delegation went to the church to watch closely the reported spiritual phenomena. They stayed there till a little before morning. At 3:40 am on the dawn of Friday, April 11, 1986, they saw the Holy Virgin in a clear form surrounded by a halo of light and the apparition continued till 5:00 am. Father Heg. Georgios Amin was also there with the committee to supervise order. 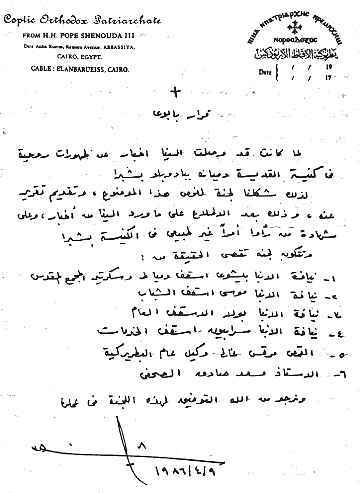 After the papal residence in Deir Anba Rueiss received news of unnatural phenomena occurring in the church of Saint Demiana the Martyr in Papadouplo, Shoubra, Cairo, starting on Tuesday, March 25, 1986 and uptill now (the date of the report), H.H. Pope Shenouda sent several bishops on different days to investigate the matter. His Holiness has also entrusted an official committee for the same purpose. Repeated apparitions of the Virgin in different forms. Pigeons and incense over the church. A very luminous and radiating unnatural light appearing inside the church tower and shining to the outside. The two towers above the church roof do not communicate with the church interior; this light continued even after the electric current was cut from the whole quarter (power outage) for a complete hour during the night of last Friday. The committee, wanting to verify and document these phenomena thoroughly, addresses all those who have seen any of these unnatural spiritual phenomena to come and present their witnesses to the papal residence. Let us thank the Lord for this blessing on the people of Egypt and for the repetition of these spiritual phenomena. We would also like to thank the police and the Department of the Interior for their untiring efforts at maintaining safety and good order among the thousands of people who have spent day and night at prayer. We ask all the people to remain calm. Thus they may worthily receive the blessing of the Virgin, of Saint Demiana and of all the saints. May God save our country. We pray that He may guide Egypt and all her children to every success. May this phenomenon be a pledge of well-being for them and for all nations. 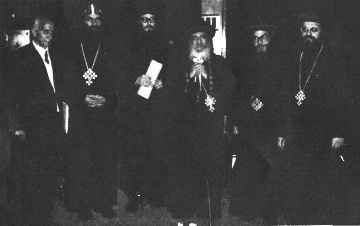 The Papal Delegation entrusted by His Holiness Pope Shenouda III to investigate the unnatural spiritual phenomena occurring in Saint Demiana church, Shoubra, after examining these phenomena with His Holiness, declares that these apparitions are a blessing for Egypt and a blessing for the Church, and are not new in our era... The apparitions go with the Lord's saying in the book of Isaiah: "Blessed be Egypt my people." The committee, while acknowledging the big efforts of policemen to keep the order among crowds reaching tens of thousands, also thanks the people for receiving these spiritual phenomena with reverence and calmness. However, due to the current interior state of the country these days, and the fact that this is an examinations season for students, and to let all people concentrate on worship in these last days of the Holy Lent and Week of Passion of our Lord, we ask all our children to take all these matters into consideration when they come to take the blessings of the church, by praying inside and leaving instead of gathering in crowds by night in the surrounding streets. We are contented to take from these apparitions their blessings, the satisfaction of the saints and the positive action of these matters in our hearts, and at the same time keep the order taking into consideration the current circumstances in our country. And blessed are those children who obey. On Saturday, Baramhat 27, 1702 A.M., the 5th of April 1986, Father Heg. Abdel Messih El-Sherbeeni and Father Samuel Younan, the priests of Saint Demiana church in Papadouplo, El-teraa El-Boolakia, Shoubra, Cairo, informed Pope Shenouda III of the occurrence of apparitions of the Blessed Holy Virgin Mary and other saints, associated with other spiritual phenomena in the church. H.H the Pope entrusted Anba Paule, now bishop of Tanta and Anba Saweros, bishop of El-Moharaq Monastery to go to the church and investigate the matter on site. The two bishops immediately went to the church and remained there till the morning and each of them presented a report to H.H. the pope affirming their personal witness of supernatural spiritual phenomena, and they reported what eye-witnesses have said, all giving the same details of apparitions of the Blessed Holy Virgin Mary and other saints starting on the eve of Tuesday, 16 Baramhat, 1702 A.M., the 25th of March, 1986. On the 9th of April, 1986, H.H. Pope Shenouda III officially entrusted a special committee to investigate the subject. On the eve of this same day (April 9), the members of the committee went to the church and remained there till the morning and saw the Apparition of the Holy Virgin Mary and the various accompanying spiritual phenomena. The committee went to the church on several occasions thereafter and the apparitions of the Blessed Holy Virgin and spiritual phenomena were repeated. These apparitions were accompanied by miraculous cure of numerous sick persons with diagnosed hopeless medical cases, like the return of sight to the blind or to persons who have suffered ophthalmic diseases for long years and have impaired sight, or the cure of patients with chronic kidney disease, heart disease and all other bodily organs' affections, many of these patients were appointed to undergo surgical operations after failure of all other methods of medical treatment. The apparitions were not limited to night hours, but also occurred during the day. The apparitions were not limited to the church towers from outside, but also occurred inside the church on the eastern side of the altar and iconostasis and on the church dome from the inside. The apparitions were not limited to the Blessed Holy Virgin Mary, but on many occasions other saints also appeared, like Saint Demiana preparing for the apparitions of the Blessed Holy Virgin Mary, and more than this, the very clear apparition of the Blessed Virgin holding our Lord Jesus Christ on Her arms, as seen in the morning of Friday 14 Baoona 1702 A.M., the 20th of June 1986, during the Holy Mass held by Father Heg. Dawod Tadros, the priest of Virgin Mary church at Rod El-Farag and member of the General Melly Council and the Clerical Council (who was praying in Saint Demiana church on this day). The apparitions and transfigurations were repeated over a long period and still occur at the time of writing of this report on Friday 14 Baoona 1702 A.M., the 20th of June 1986. The apparitions were not limited to luminous transfigurations, but at other times flames were seen, when the Virgin appeared surrounded by flames or tongues of fire that ultimately changed into very bright light, as witnessed by the members of the Papal Delegation. of the members of the Papal Delegation are also seen. The Virgin surrounded by a halo of transparent light. The Virgin with a halo of light surrounding Her head. The Virgin looking at the crowds and extending Her arms toward them and blessing them. The sad Virgin looking downwards. Sometimes the details of the Virgin could be distinguished. A very strong light starting from inside the domes and shining to the outside, lighting up the whole area with a lightning flash that shone over the surrounding houses and was seen from a long distance. 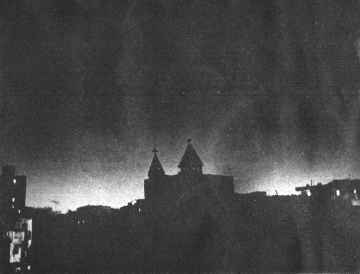 On April 10, 1986, at 4:00 am, a flame of light (see figure on the right) was also seen propagating from the western tower of the church and then returning back to it, turning the darkness of the night into light. The flame had a wavy surface, showing interlaced tongues and waves of light and fire, varying in colour from orange to very bright white. 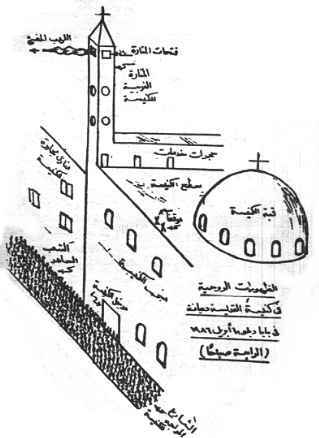 The accompanying diagram shows the crowds of night vigils gathered in the very narrow street in front of the church of Saint Demiana and the flame of light propagating from the western tower of the church. 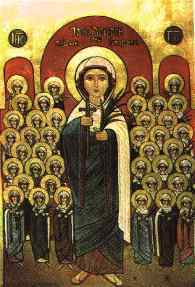 Saint Demiana (see icon of Saint Demiana the Martyr on the right) also appeared holding a green branch, as if preparing for the apparition of the Holy Virgin. Light radiating from the western tower taking an oval shape -- a white pigeon appeared in the middle of this light, opening its wings and flying over the church. A light shining from the western tower through which the Holy Virgin appeared in a clear form. A luminous mass from the west going towards the east through which the Holy Virgin and Saint Demiana appeared, then the mass disappeared and the Virgin remained in sight. The Virgin extending Her hands towards the crowds then moved towards the balcony inside the church and started to move upwards towards the sky till She disappeared. A white light shone over the western tower and illuminated the cross made of wood, making the cross appear like a flame. During the apparition of the Holy Virgin, writings in Coptic letters were seen. A mass of light over the veil of the altar which grew bigger, then Our Lady appeared walking. The Virgin in Her full body dressed in white, blue and red colours in front of the western dome. The Holy Virgin in the hollow of the central dome inside the church, beside the painting of our Lord Jesus Christ on this dome. A rectangular light shining on the veil of the altar then turning three times around the church over the heads of the crowds. The Virgin amidst an orange cloud over the eastern tower. On the night of Sunday, April 13, 1986, the Holy Virgin appeared in Her full body of normal size with three bright and luminous colours: white, blue and red, and the whole body was luminous and could be seen beside the church domes overlooking Abd El-Metaal street. The apparition lasted for a few seconds just before one o'clock in the morning, and then after about half an hour the same apparition was repeated and also a lightning flash of light appeared along the church wall more than once. On many occasions, our Lady appeared inside the church near the veil of the altar during morning hours, e.g., on Saturday, July 12, 1986 (Abib 7, 1702 A.M. -- the feast day of the Apostles and the martyrdom of Saints Peter and Paul) at 10:30 am, and also on Monday, July 28 (Abib 21), the monthly Coptic remembrance day of our Lady the Blessed Holy Virgin Mary. The mother of Theresa Soliman Youssef (6 years old) reports the miracle that the Blessed Holy Virgin Mary did to her daughter: Theresa had lost vision in her right eye after a tricot needle pierced this eye and injured the cornea and eye lens, causing traumatic cataract. The girl was unable to see using this eye; this occurred on November 17, 1984. I can see mother... I can see mother! She could put her hand over her left (good) eye and still see with her right eye which was once blind. Dr. Fayez Akhnoukh, who also serves at Saint Demiana church, examined the child, tested the visual acuity of both of her eyes, and found that the girl could now see using her right eye which was healed miraculously. Father Raphael El-Anba Bishoy who was at this time helping Father Heg. Abdel Messih El-Sherbeeni, the church priest, has recorded and documented this miracle.